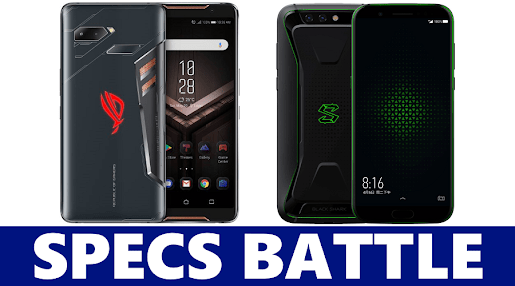 Asus ROG Phone VS Xiaomi Black Shark: Gaming smartphone powered by Snapdragon 845 chipset. We have a new entry into the world of gaming smartphones. Since the first gaming smartphone “Razer Phone” was released towards the end of 2017, a lot of other companies picking up interest to manufacture a gaming smartphone. The newest gaming smartphone on the market is from Asus, which called “Asus ROG Phone“. Being the newest gaming smartphone means it should feature a lot of innovative stuff not found in other gaming smartphones. Prior to the announcement of the Asus ROG Phone, the fans favorite and arguably the best gaming smartphone was from Chinese phone maker Xiaomi, which is called the Xiaomi Black Shark. So what better way for the Asus ROG Phone to make a grand entry, if not challenging the Xiaomi Black Shark. This article is a detailed comparison between the new Asus ROG Phone and Xiaomi Black Shark. Unlike other gaming smartphones, the Asus ROG Phone and Xiaomi Black Shark comes with their unique design. The design on both smartphones gives you that gaming vibes. Most times, the design is a thing of preference. So if am to choose, I’ll go with the Xiaomi Black Shark. The Asus ROG Phone and Xiaomi Black Shark features a front and rear glass with aluminum frame, the glass is Corning gorilla glass. The Xiaomi Black Shark weighs 190 grams with 9.3mm in thickness while the Asus ROG Phone weighs 200 grams with 8.6mm thickness. The new Asus ROG Phone features a rear-mounted fingerprint sensor. While the Xiaomi Black Shark features a fingerprint sensor mounted in its home button. The two gaming smartphones feature a dual rear camera set-up at the top left corner. The Xiaomi Black Shark is available in two body colors; Black and Gray. While the Asus ROG Phone comes in only a Black color option. The Asus ROG Phone becomes the first gaming smartphone to feature an AMOLED touchscreen. This is a big win for Asus if you ask me. The Asus ROG Phone features a 6.0-inch screen size, 76.9% screen-to-body ratio, an 18:9 aspect ratio, 1080 x 2160 pixels resolution and 402 pixels per inch density. While the Xiaomi Black Shark features a 5.99 inch IPS LCD panel, 76% screen-to-body ratio, an 18:9 aspect ratio, 1080 x 2160 pixels resolution and 403 pixels per inch density. The display of the Asus ROG Phone features 108.6% DCI-P3 color gamut, Wide Colour Gamut, HDR and 90Hz (1ms pixel response time). While the display of the Xiaomi Black Shark features only a 97% DCI-P3 coverage. Asus Zenfone Max Pro M2 VS Xiaomi Redmi Note 6 Pro: Which One Should You Buy? Gaming smartphone doesn’t necessarily need good camera specs but I still feel such high-end smartphone is obligated to have good camera specs. The Asus ROG Phone’s dual rear camera features a 12MP primary sensor with an 8MP secondary sensor. At the front, is an 8MP front-facing camera on the Asus ROG Phone. These camera specs can easily be found in most mid-range smartphone. The Xiaomi Black Shark packs a dual rear camera consisting of a 12MP primary sensor with f/1.8 aperture and 20MP secondary sensor with f/1.8 aperture. At the front camera of the Black Shark is a 20MP shooter with f/2.2 aperture. This is what am talking about, good camera specs on a gaming smartphone. No matter the gaming features, it’s still a smartphone and I might want to take photos every now and then. Powering both the Asus ROG Phone and the Xiaomi Black Shark is Qualcomm Snapdragon 845 chipset coupled with Adreno 630 graphics processing unit. While the Snapdragon 845 chip on the Xiaomi Black Shark clocks at 2.8GHz. The Snapdragon 845 chip on the Asus ROG Phone is said to clock at 2.96GHz, due to Asus using an overclocked version of the chipset. To handle the constant hot temperature the device, the Xiaomi Black offers a liquid cooling system. While the Asus ROG Phone offers a GameCool vapor-chamber cooling system. Running on the Xiaomi Black Shark is Android 8.1 Oreo on top of Joy UI, 6GB memory with 64GB storage or 8GB memory with 128GB storage. While running on the Asus ROG Phone is ROG Gaming UI skin on top of Android 8.1 Oreo, 8GB memory with either 128GB or 512GB storage. Both the Asus ROG Phone and the Xiaomi Black Shark packs the same non-removable Li-lon 4000 mAh battery. The Xiaomi Black Shark supports quick battery charge 3.0 while the Asus ROG Phone supports quick battery charge 4.0+. The Asus ROG Phone will be priced around $790 (N276,500) while the Xiaomi Black Shark goes for about $523 (N183,050). Though, the Asus ROG Phone comes with another level of extraordinary features. But is it a better quality-price ratio than the Xiaomi Black Shark? Well, let us know your opinion in the comment section below.